In recent years, I’m sure you’ve noticed more and more restaurants and fast-food chains adding vegetarian and vegan-friendly dishes to their menu. Vegetarian is the hottest food trend lately, as more and more Americans are seeking out a veggie-friendly diet. Vegan foods recently topped $3.1 billion in sales, according to the US Plant Based Foods Association and the Good Food Institute, and demand is only going to continue growing. Other studies are showing that 40% of Americans are cutting down on the amount of meat they eat. 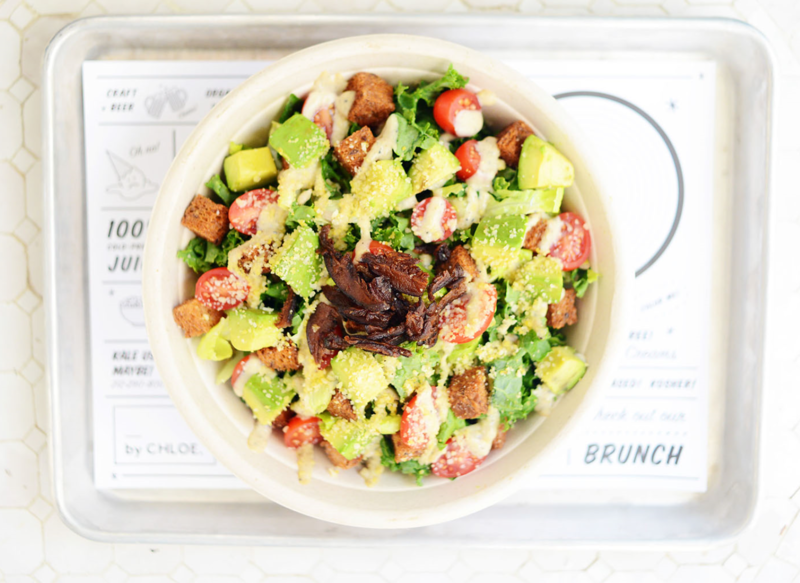 With the market for vegan food exploding across the country, so too are vegan-centric restaurants, like Sweetgreen and By Chloe, which have become popular by demand. These restaurants are leading the veggie wave with vegan/vegetarian recipes that are tasty, creative and desirable. 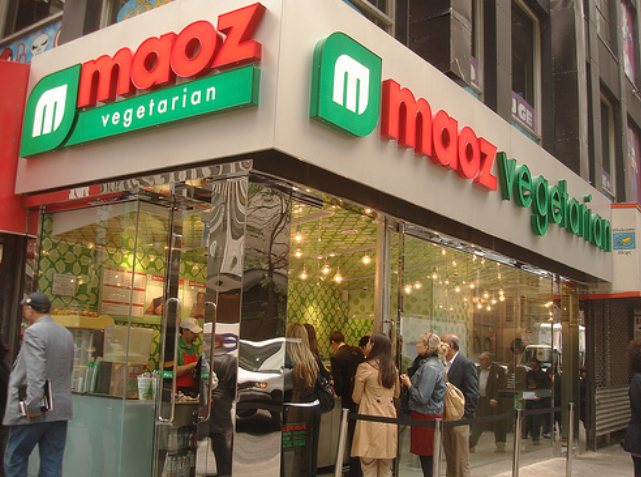 Luckily, these vegetarian restaurants that cater in NYC are available for catering online with MobyDish. As we’re all becoming increasingly aware of health concerns and the environment, there is most likely a handful of coworkers practicing vegetarian or vegan habits, and it’s becoming more and more necessary to include options for them with every corporate catering event. 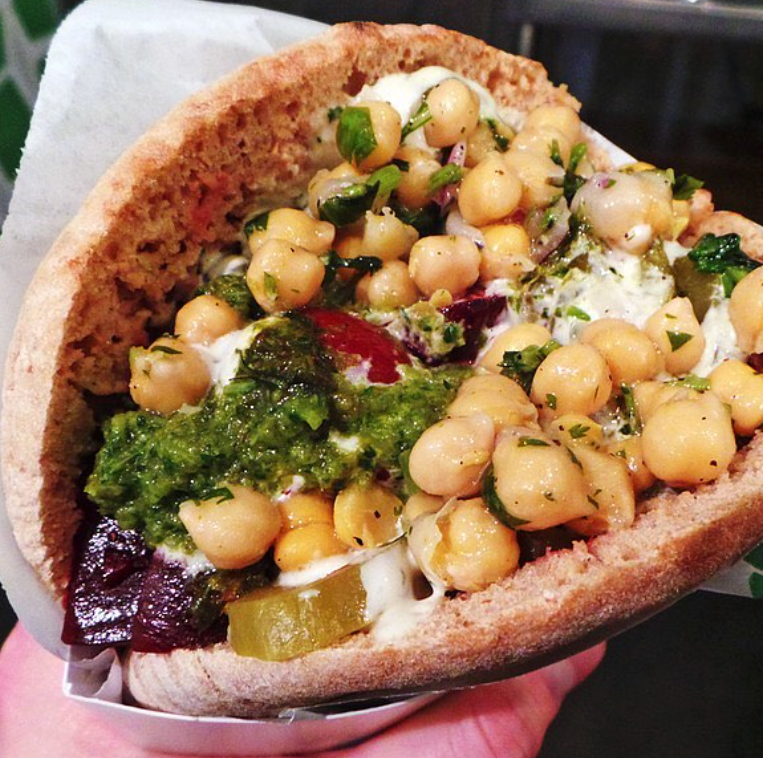 With that being said, as experts in catering, we recommend the below Top 5 Vegan Catering and Vegetarian Catering restaurants in New York City . 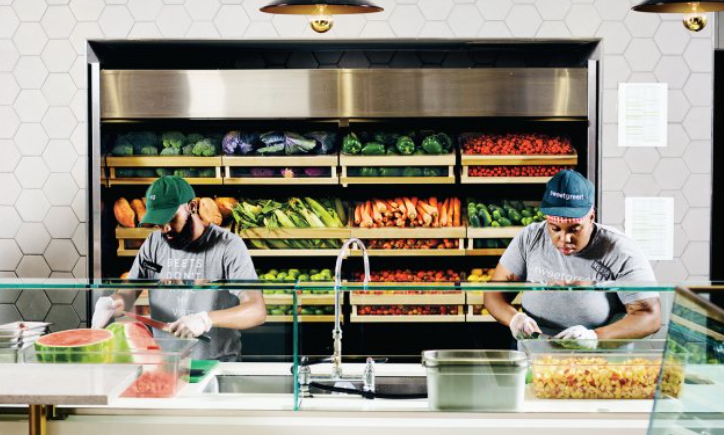 Founded back in 2007, Sweetgreen was created to be the destination for simple, seasonal, healthy food. The mission was simple: to inspire healthier communities by connecting people and real food. Sweetgreen is committed to supporting small and mid-size growers who are farming sustainably, to creating transparency around what’s in your food and where it came from, and to creating more accessibility to healthy, real food for more people. All the while, keeping great taste intact with delicious flavors in every bowl. Food catering with Sweetgreen comes in the form of individual bowls for every person, guaranteeing portions are met for every group size. 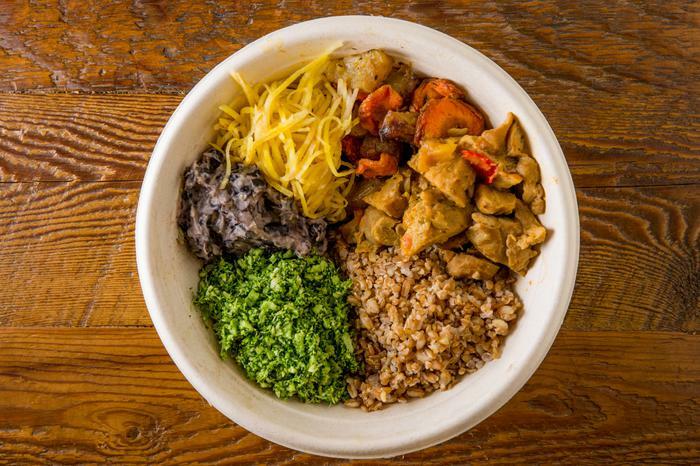 Healthy lunch catering in NYC is done right with Sweetgreen! 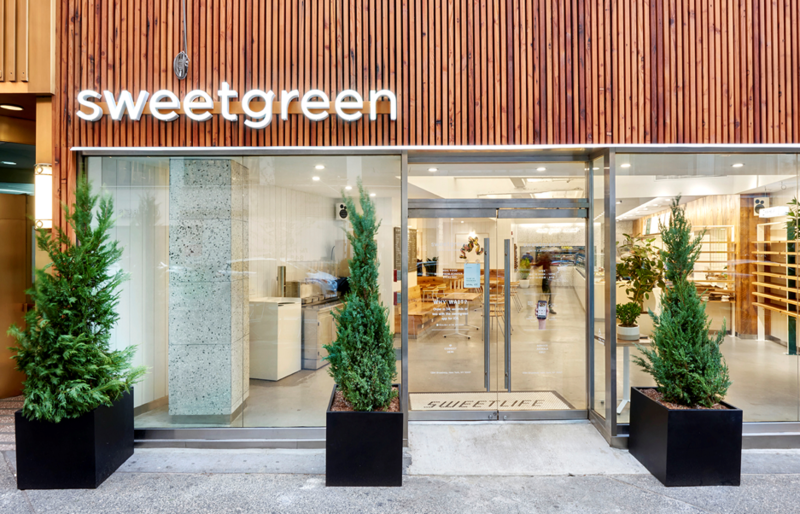 To learn more about Sweetgreen, visit their website here. 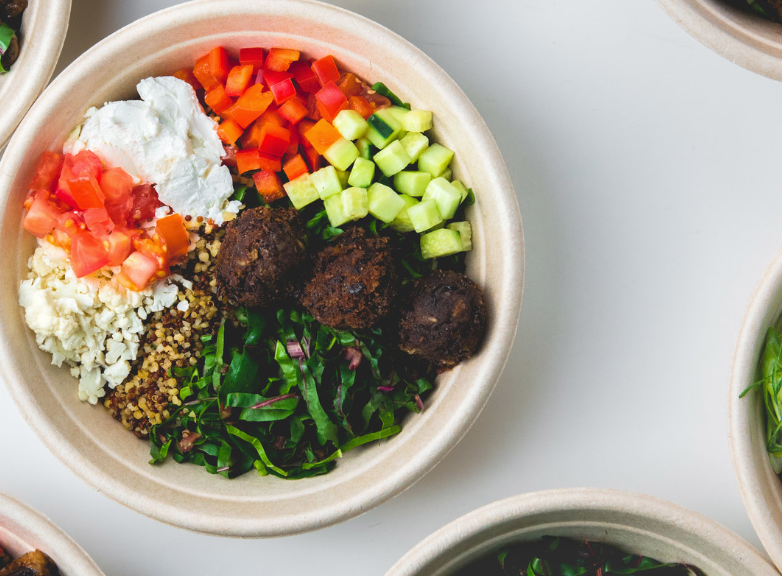 A staple on Sweetgreen’s core menu, this bowl features herb falafel, a melody of chopped fresh vegetables, housemade hummus and a cucumber tahini yogurt dressing. This vegetarian-friendly dish blends middle eastern flavors with freshness in a tasty mix. 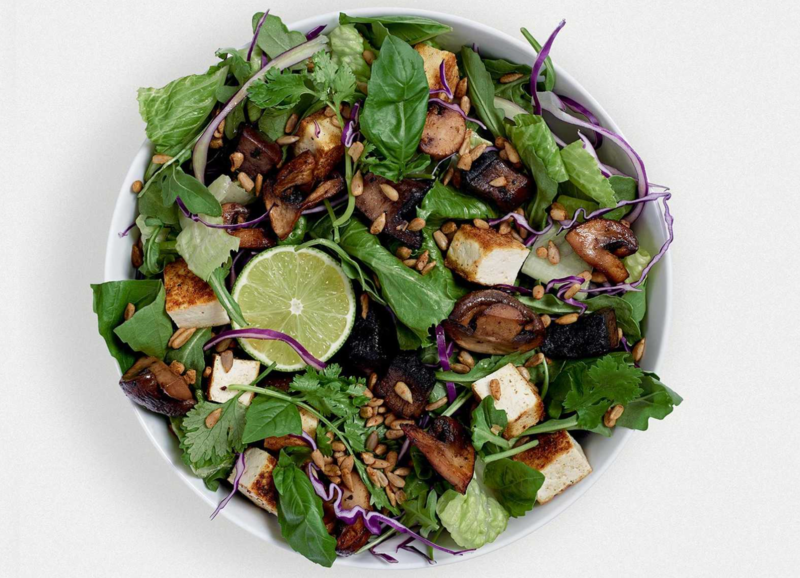 Part of Sweetgreen’s seasonal rotation, this bowl is vegan-friendly with roasted sesame tofu along with other complementary fixings like basil, cilantro, spicy sunflower seeds and spicy cashew dresssing. 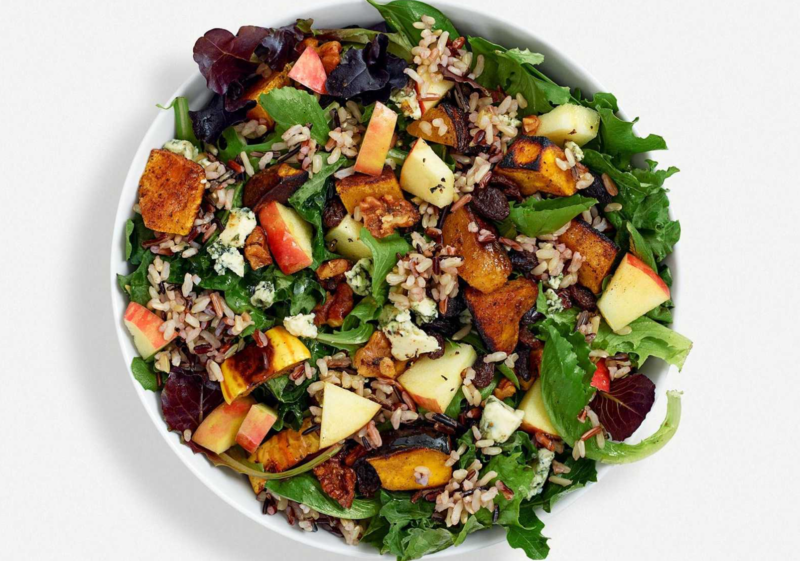 A seasonal hit, this popular warm bowl also appeals to vegetarians with apples, blue cheese, roasted squash, raisins, umami walnuts and balsamic vinaigrette. Warm harvest flavors come together for a hearty, healthy meal! Take corporate catering to the next level and let your coworkers try clean, fresh, healthy food from a name they all know and love. Skip the 30 minute lunch queue at every Sweetgreen in the city, and have it catered to your office instead! 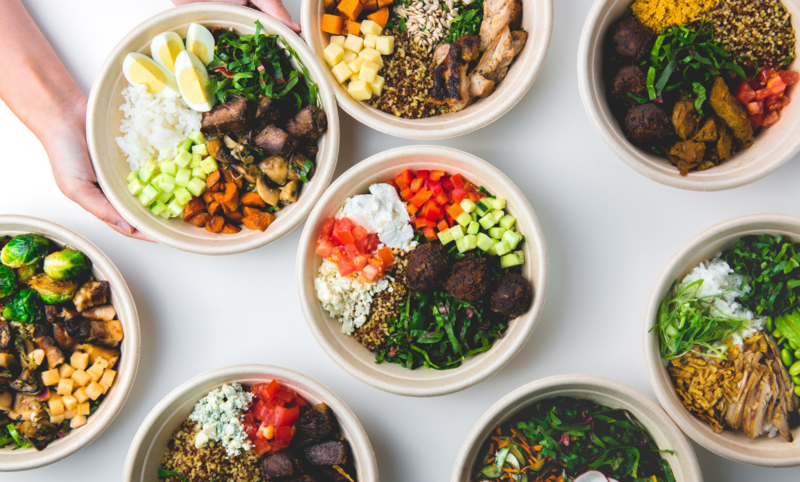 MobyDish makes food catering delicious, easy and reliable… working with only quality and trusted partners like Sweetgreen who address all dietary needs and restrictions. 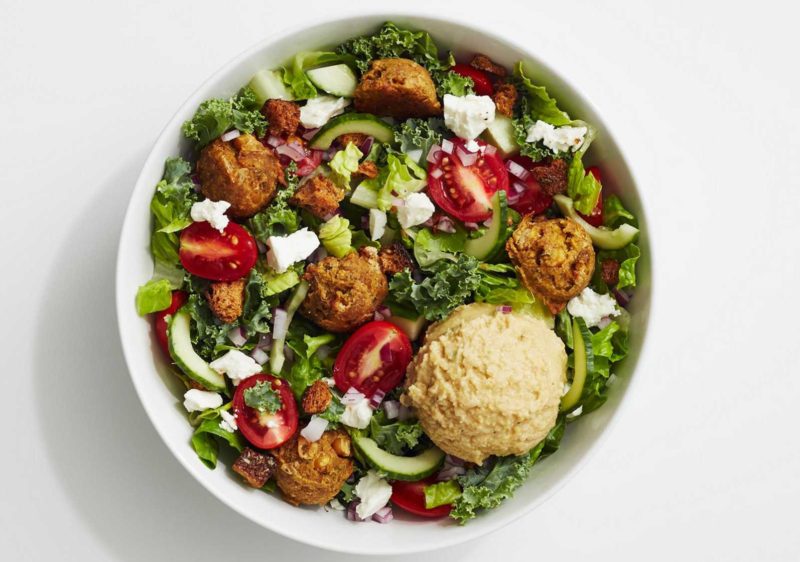 All your coworkers, vegetarians and vegans alike, will appreciate Sweetgreen catering! At its foundation, Local Leaf’s mission is providing healthy nourishment for its customers and creating a positive impact on the world around us. 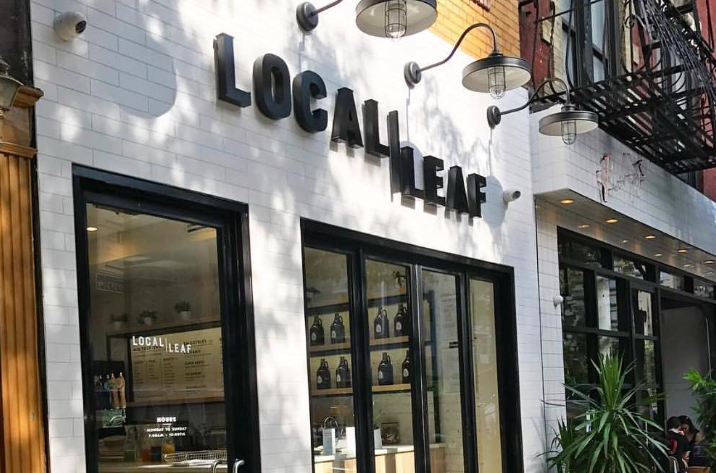 Just as the name suggests, Local Leaf is dedicated to using area vendors to support the local economy, sourcing eco-friendly ingredients and minimizing food waste. 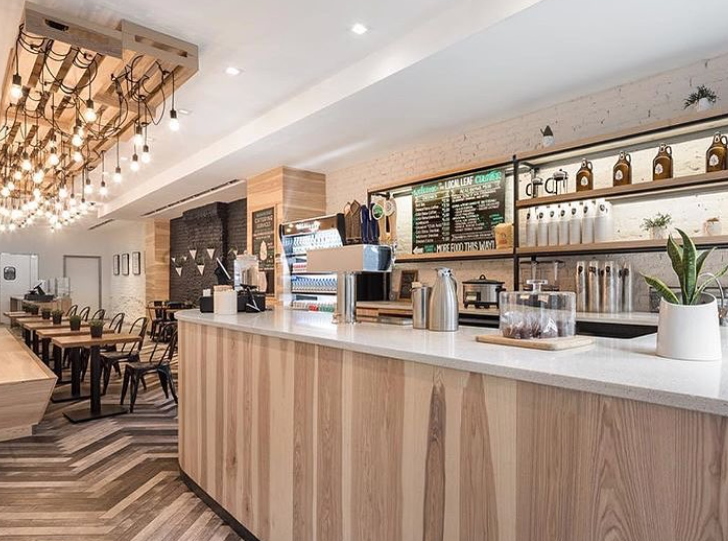 To elaborate, not only are Local Leaf’s dishes fresh, chef-crafted and made from responsibly sourced local ingredients, but any unsold food items are donated to area charities at the end of each day. They are focused on reimagining common menu items and offering a healthy and delicious approach to all-day dining. From signature and customizable lettuce wraps, to platters, hydrating drinks, and breakfast crepes… this is healthy yet delicious gourmet fare. Local Leaf’s specialty is the make-it-your-own, do-it-yourself bowl bar! 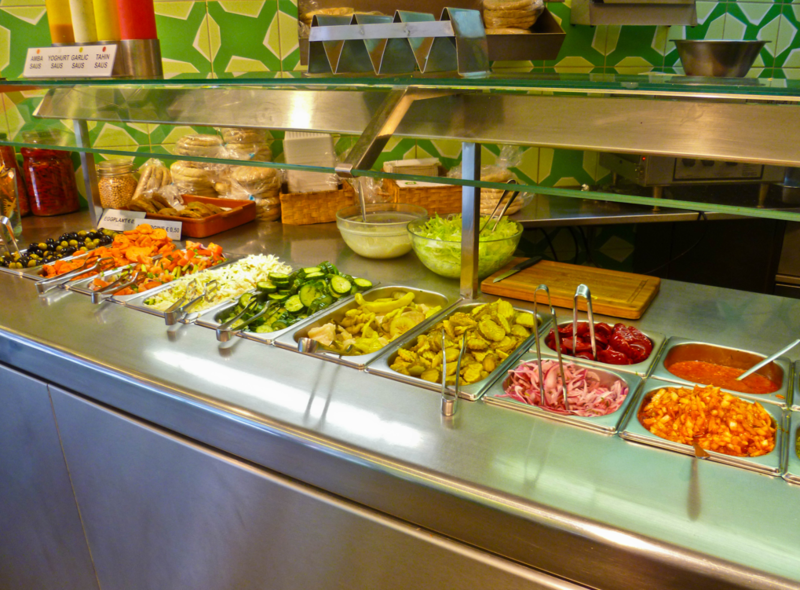 For food catering, the ingredients come in separate trays – family style – so you can pick and choose whatever you like! Select a base (wrap, salad, or grains), your grain, a protein and some toppings! This is friendly for all types of diets and health concerns, a huge win for the office lunch! While DIY bowls are made to your desire, Local Leaf also offers a core menu with signature bowls all season long. The Soho Bowl happens to be a Moby favorite, with delicious middle eastern flavors making for a hearty lunch catering meal. It includes spicy tomato braised seitan, market mix, spicy pickled beets, black bean hummus, broccoli cous cous with balsamic-agave. Vegetarian-friendly and vega-tasty! 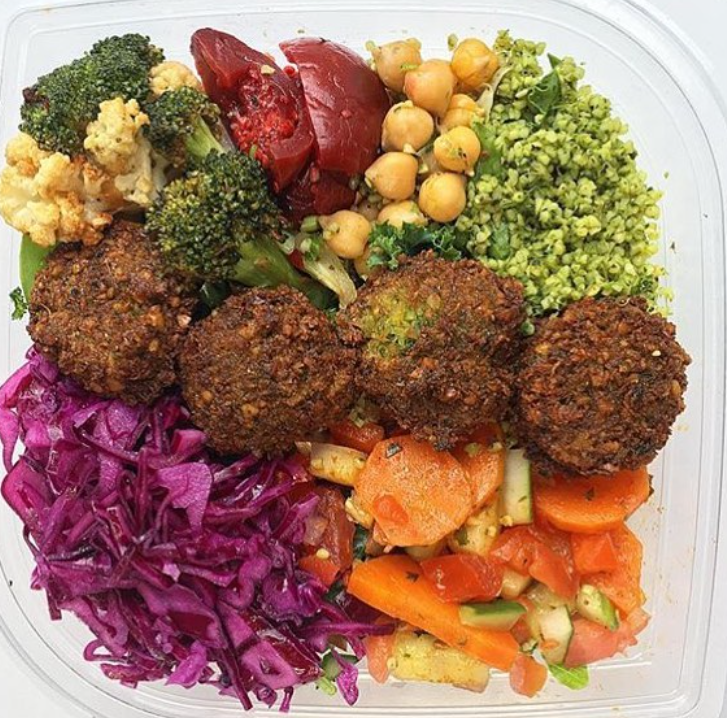 The other vegetarian bowl on the signature menu, Curry Hill features yummy sweet potato falafels on a gluten-free grain blend, with chickpea hummus, carrot slaw, spicy pickled beets, curry lentils, cucumbers, tomatoes with caramelized onion dressing. Definitely a must-try! Local Leaf catering has got you and your team covered. Keep it fresh and healthy for your office lunch, and let Local Leaf make your company lunch complete! 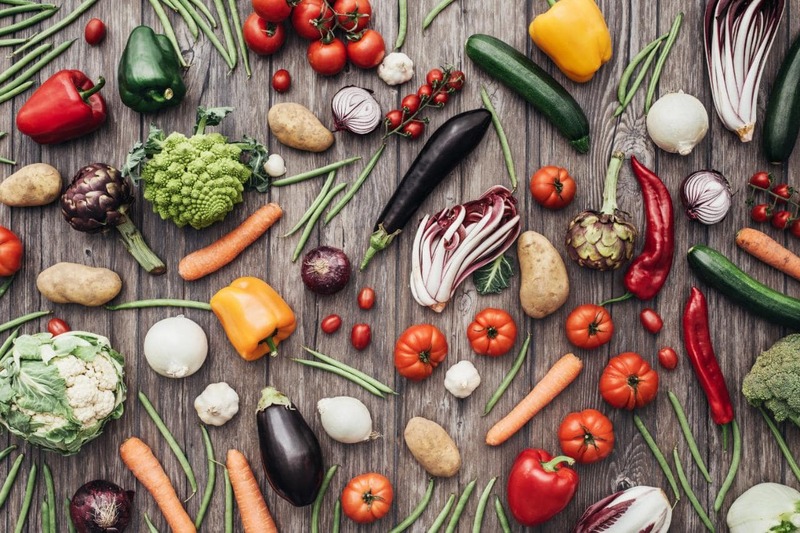 It’s no surprise that, in recent years, there has been a growing trend toward vegetarianism and veganism as we’re all becoming increasingly aware of health concerns and the environment. Numerous polls done by research firms show that the number of vegetarians in the American population has increased as much as 70% over the last ten years! A vegetarian or vegan diet has been known to improve eating habits and overall health. At your office, there is most likely a handful of coworkers practicing vegetarian or vegan habits, and it’s becoming more and more necessary to include options for them with every corporate catering event. And let’s be real, we can all benefit from a clean, healthy vegetarian meal! 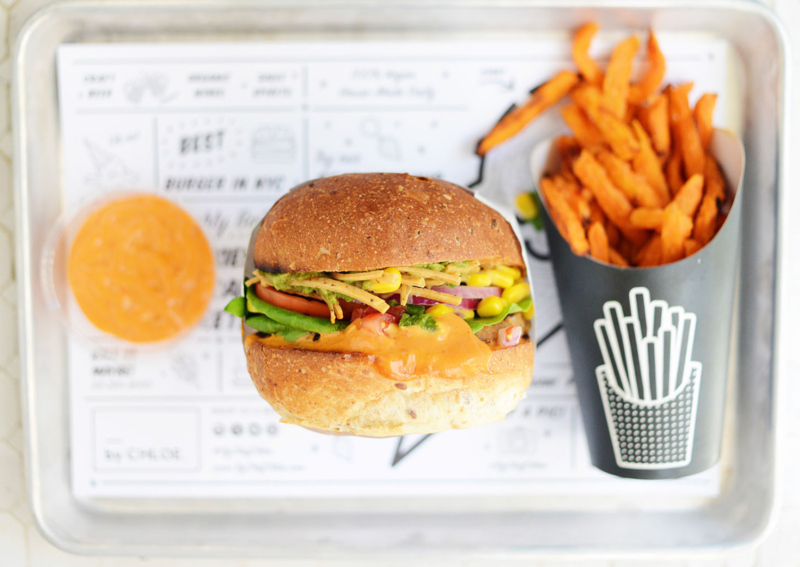 Forget burritos and burgers – today, veganism is the hottest trend in the food industry! 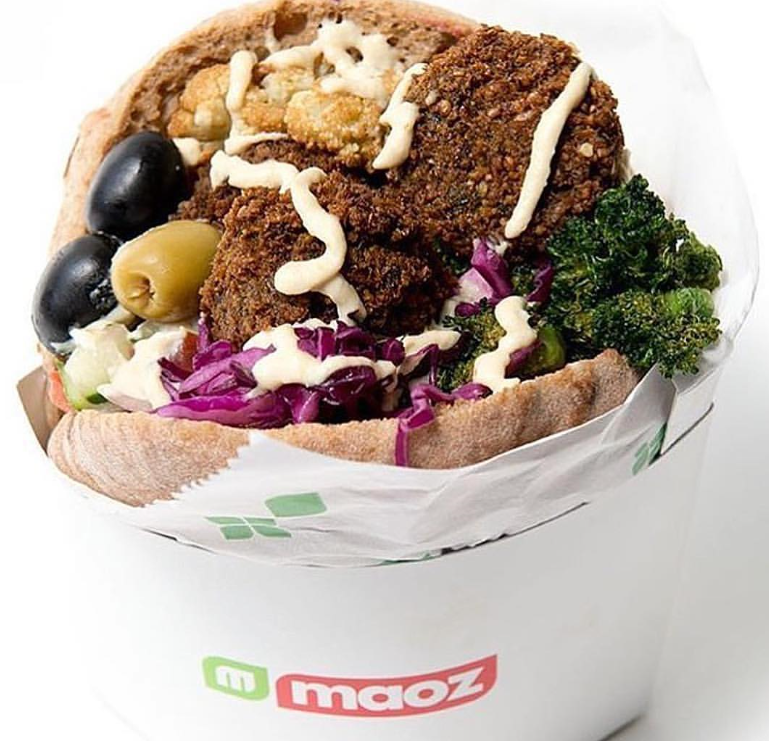 Vegetables are taking over the menus of restaurants and fast-food chains alike, from greasy omnivore favorites like Taco Bell to new vegan concepts like By Chloe. Business Insider went on to quote a study that revealed 40% of Americans have reported cutting down on the amount of meat they ate. More and more food establishments are realizing that adding more vegetables to a menu and making it more vegan-centric is a great way to appeal to the average American, who may not be committed to a 100% meat-free lifestyle, but want to dabble in a more veggie-friendly diet. With veganism going mainstream, concepts like By Chloe have exploded onto the scene, forming cult-like followers and becoming a reliable and loved brand name. By Chloe catering is now possible with MobyDish. If you’re searching for vegan catering for your next office lunch, By Chloe’s is your place! 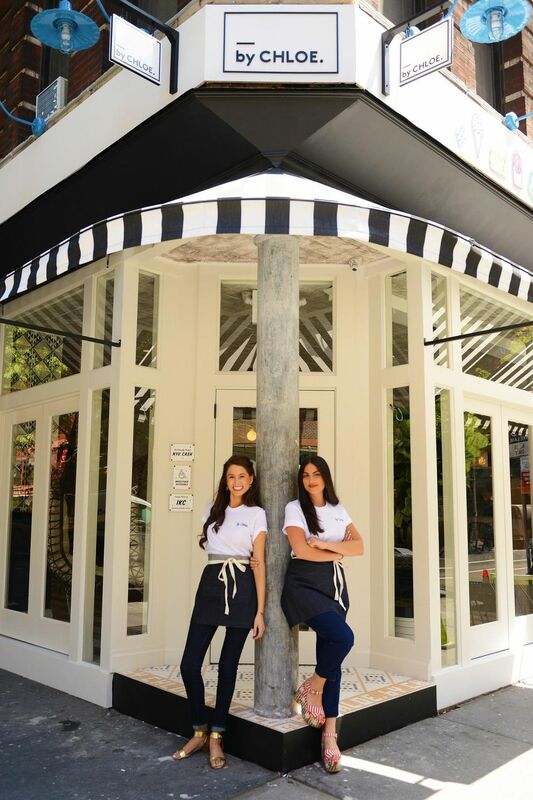 Based out of NYC, By Chloe was founded back in 2014 by celebrity vegan chef, Chloe Coscarelli, and the creative director of a hospitality group, Samantha Wasser. The menu was 100% vegan – no meat or meat by-products included. At the time, By Chloe was really the first of its kind, pioneering the concept of vegan fast-casual that was both healthy and delicious. 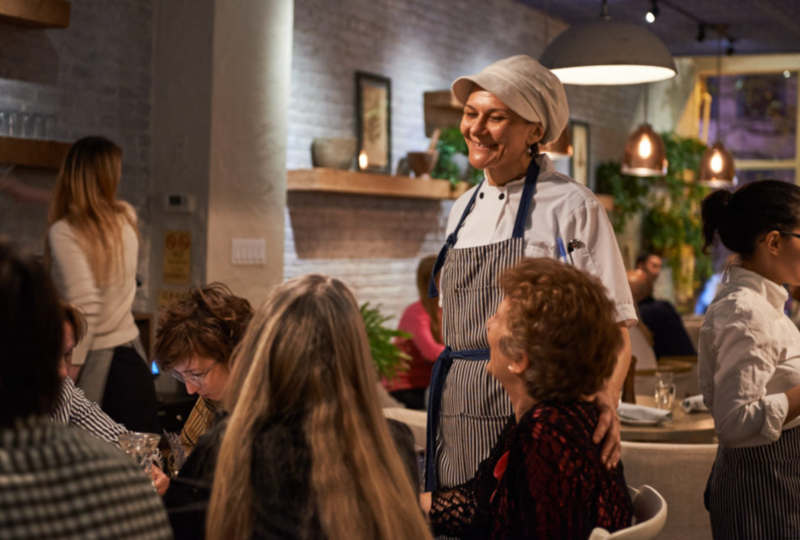 New Yorkers quickly learned that By Chloe’s recipes were unique, delicious and uncompromised in flavor and the reception was overwhelming. 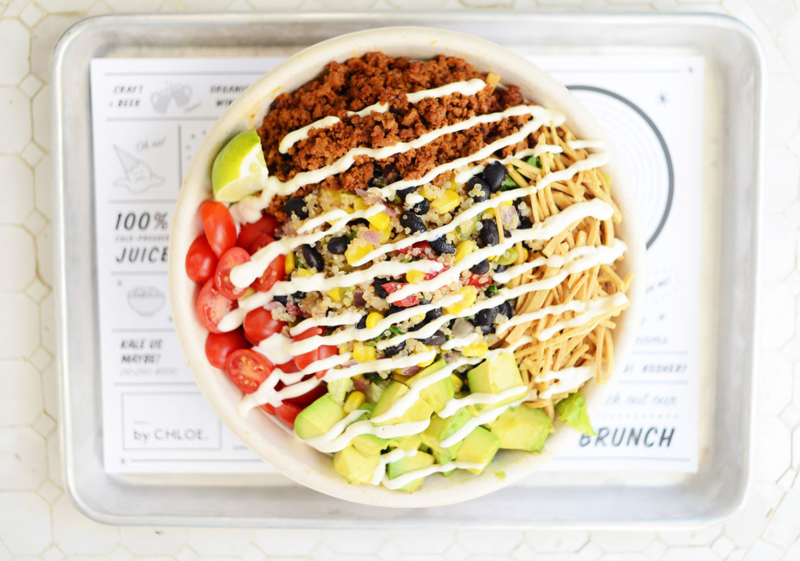 From a single shop near NYU to now a national chain spanning the east and west coast, vegans and non-vegans alike often endure long wait lines and swarm by Chloe stands to get their fix. Get your fix today for a vegan office lunch and order By Chloe catering online with MobyDish! Another popular choice, this bowl boasts bold flavors with chopped romaine, spicy seitan chorizo, black beans, sweet corn, avocado, tomato, tortilla strips, crèma and agave-lime vinaigrette. Mouthwatering and vegan-chic! Not your average salad! The flavors are on point here – the combination of the dairy-free dressing and avocado is rich and creamy, contrasted nicely with the crunchy greens and crispy shiitake bacon. Don’t miss out on the vegan trend and get office vegan catering right away! Food catering can be tasty AND healthy for all diet types in your office. By Chloe catering is just a click away on MobyDish – your office won’t regret it! Divya’s Kitchen is consistently ranked one of the top vegan and vegetarian restaurants in the city (they just received the Diners’ Choice Award for Best Healthy Restaurant in the NY Tri-State Area on OpenTable!). This restaurant serves up healthy, holistic vegetarian catering dishes based on the Ayurvedic approach. Ayurveda… we see this word intermittently in health magazines, around yogis, or in recipes describing some new health elixir. This two-thousand-year-old philosophy has its roots in India, with traditions to treat the mind, body and spirit. There are many people that have taken up the Ayurvedic way of life, from the way they view and treat humanity and nature to the way they sleep, exercise and eat. In fact, a core tenet of Ayurveda is to ensure one’s food is highly pranic, the Yogi word for life force or vitality. Ayurvedic food should be intelligent and high in prana, so that the body can feel and recognize the vitality and energy within the food and flourish as a result. 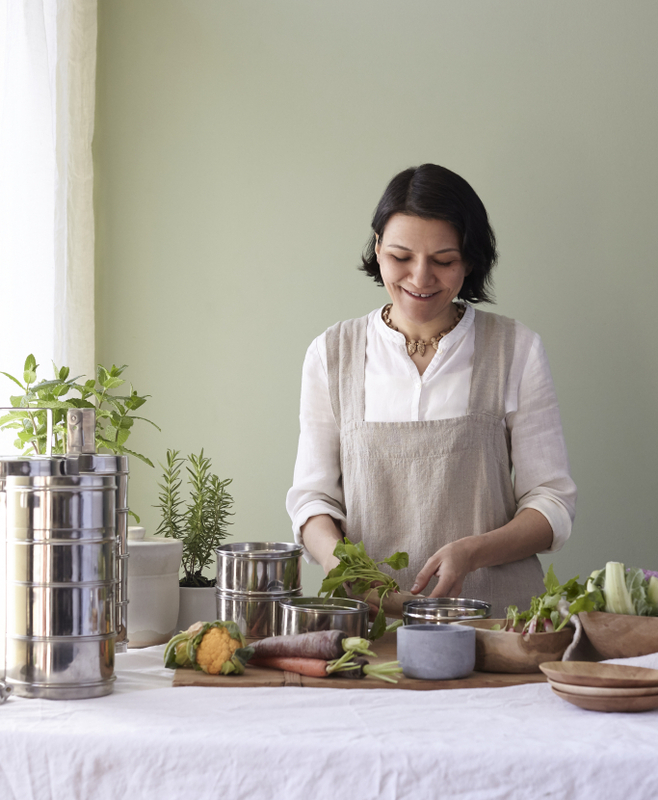 Chef and owner of Divya’s Kitchen, Divya Alter, is trained in Shaka Vansiya Ayurveda and is adamant about applying Ayurvedic concepts to her cooking and making Ayurvedic food accessible to all via vegan, vegetarian and gluten-free recipes. The 1,400-square-foot eatery seats 50 and offers globally inspired, nourishing dishes from Italy, the Mediterranean, India and Asia. 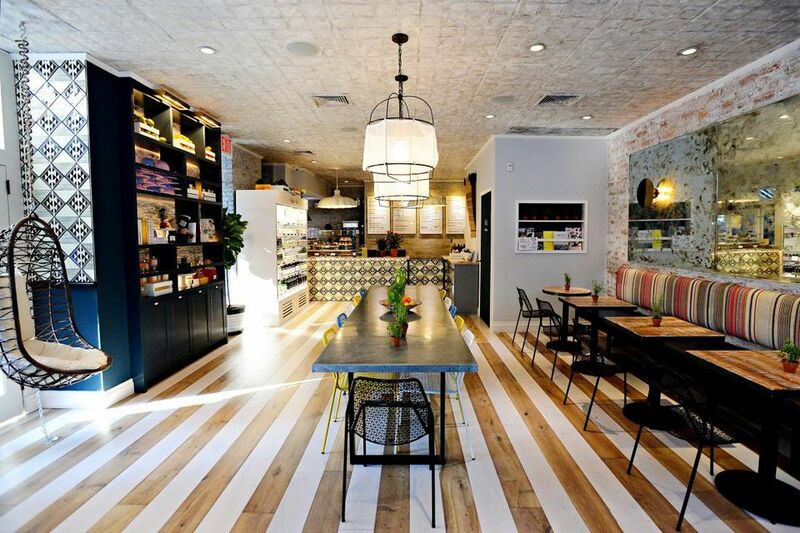 Heal your body at NYC’s first Ayurvedic resto. 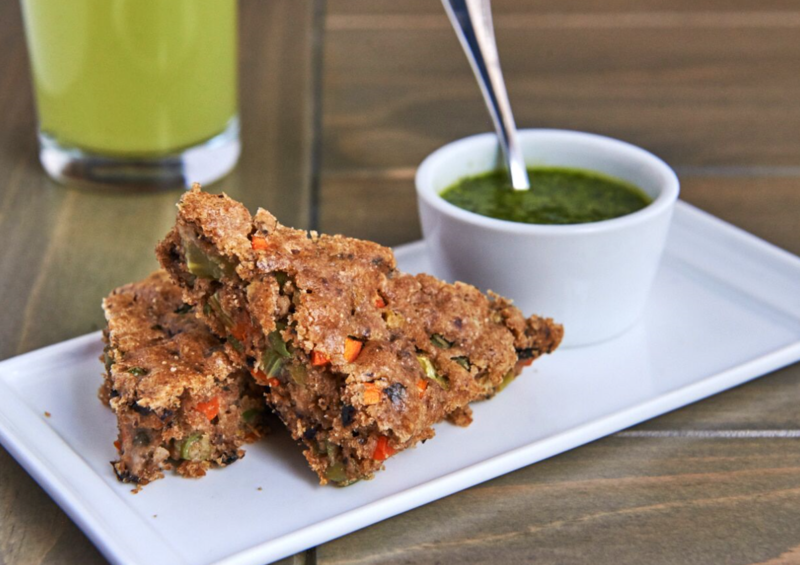 Divya’s Kitchen offers a variety of vegan small bites from coconut chips to spelt-sesame crackers, but the app that stands out is definitely the Focaccia Bread. Made from house-milled spelt flour, carrots, celery, green beans, olives, herbs, basil-parsley pesto… the bread is scrumptious and completely vegan. While all of Divya’s bowls are quite tasty, the vegetable curry is the popular choice among diners. 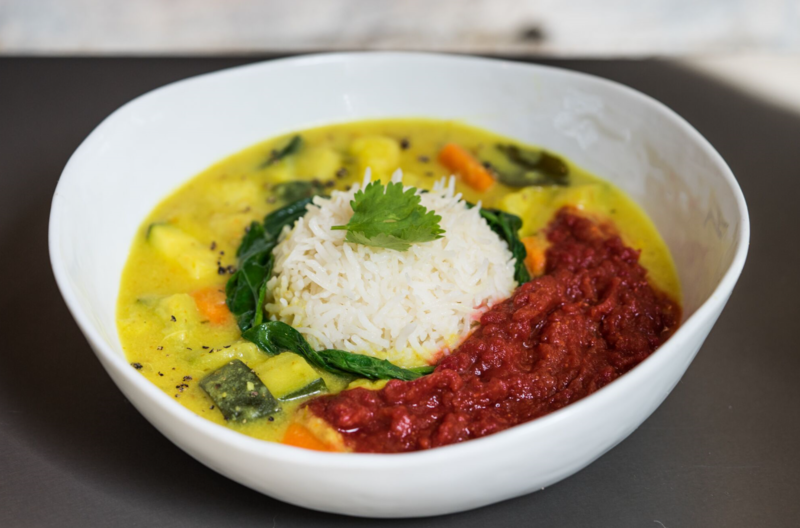 The veggie curry is served in cashew sauce, basmati rice, curried rice lentils and beets. This bowl warms and soothes the soul, and whether you practice Ayurveda or not, you can’t doubt the nourishing energy that comes from digesting this dish. 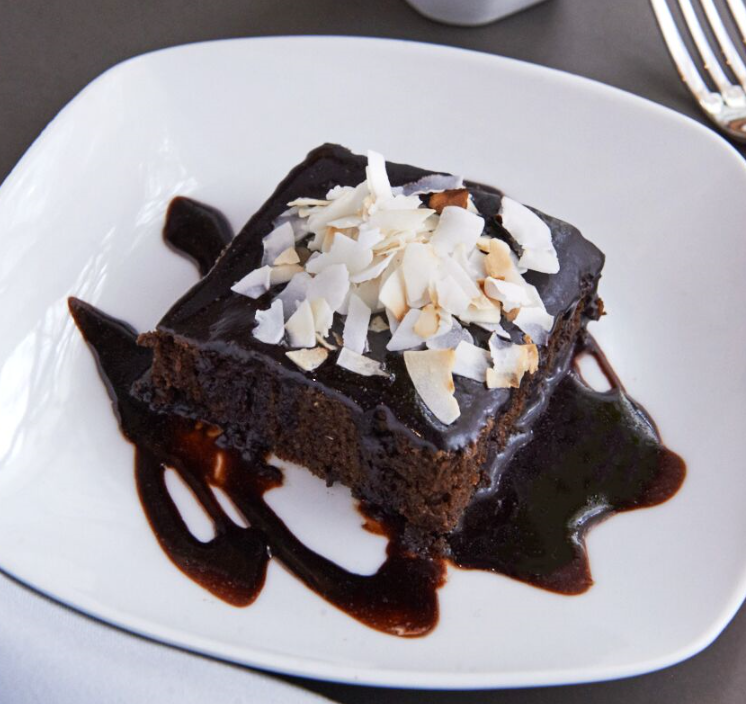 You will not believe this is a completely vegan and nut-free desert, with its decadent flavor. Made from house-milled einkorn flour, coconut sugar, coconut oil, carob, and topped with coconut chips. Incredibly satisfying! Divya’s Kitchen’s entire vegan catering menu is available online at MobyDish.com, so bring New York’s most top-rated vegan restaurant to your office! Revive your office energy and spirit with holistic food from NYC’s favorite Ayurvedic restaurant. When it comes to corporate catering or a large company lunch, it gets tricky to meet everyone’s dietary and health needs. Finding a balanced catering meal is not as easy as it sounds. Office managers can spend hours researching the right diet-conscious restaurant, and spend even more time going back and forth with the restaurant to finally land on a catering order. With us at MobyDish, you don’t have to sweat about your office catering event. We hand-pick our restaurants who surpass our rigorous standards on quality. We screen every catering menu to ensure all dietary restrictions are addressed, and make that completely transparent for you on the platform. Online catering the Moby way is easy and reliable, simply look for the “vegetarian” or “vegan” tags (along with our other tags calling out allergens like gluten, nuts etc.) on every catering dish.